Bug hunting is one of my favorite photographic endeavors. Armed with my D600 and trusty 105mm macro lens, I head out into our front field to bag my quarry. You have to be slow and quick at the same time, moving slowly and patiently to see what’s around you, then moving in quick to get the shot. I never really know what I’ve got until I get back home and dump the images onto my computer. In this particular round, the crab spider with the fly in its mouth was a complete surprise. Even through the lens, I thought the black bit was the spider’s eyes. When I blew it up, I discovered that I wasn’t the only one hunting bugs! Most of these shots were taken at ISO 800 with apertures between f/8 and f/13 and shutter speeds of 1/800″-1/2000″. A tawny-edged Skipper on a milkweed leaf. 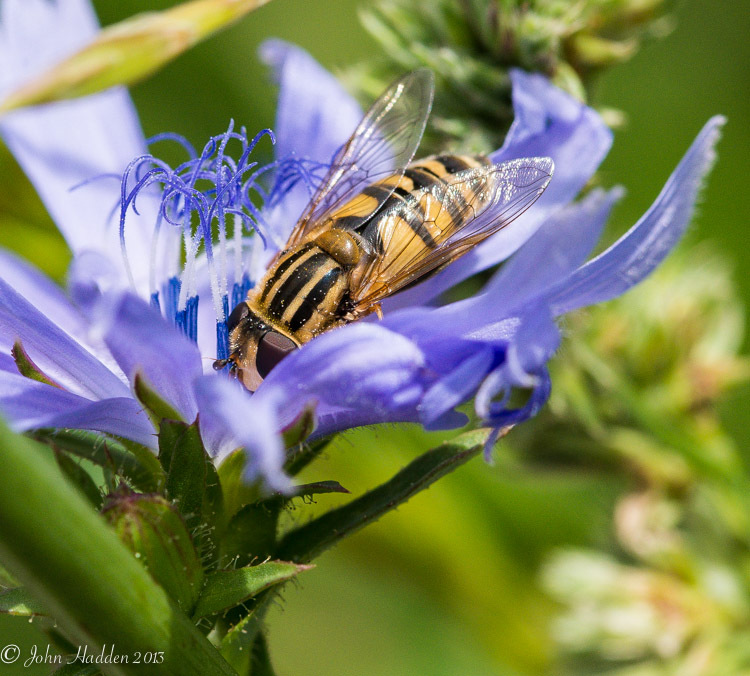 A large bee-like fly works a chicory blossom. Photo Info: Nikon D600, Sigma 105mm, ISO 800, f/13, 1/800″ exposure. What do you shoot when it’s been raining daily for the past week? Why fungi of course! Here’s a gallery of shots taken this morning up in the woods behind our house. A tiny (2mm) mushroom on the side of of a spruce tree. Stringy yellow slime mold on a fallen hemlock. 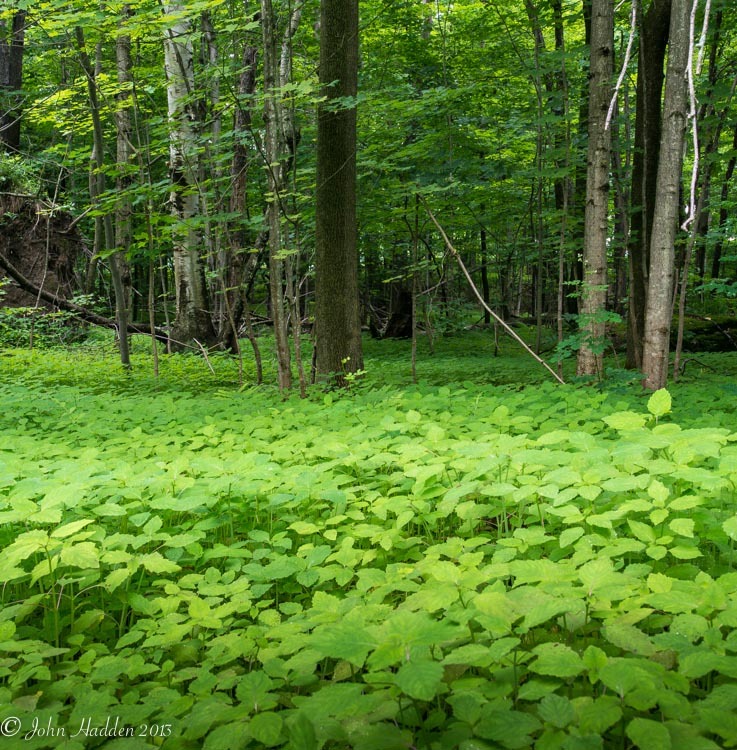 Jewel weed creates a bright green carpet stretching deep into the woods. As I was driving along Taft Road, I just had to stop and get a picture of this scene. The jewel weed carpets the woods along the road and deep into the shadows. I love the texture and tone. Photo Info: Nikon D600, Nikon 18-35mm lens @ 35mm, polarizing filter, ISO 800, f/14, 1/40″. 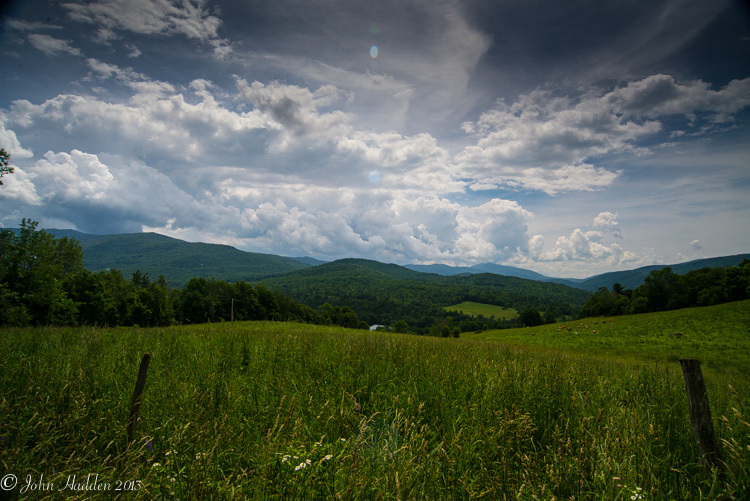 Midday cumulus congestus clouds build above the Green Mountains. This midday shot looks south from a favorite hillside about a mile from our house. The hayfield and cows (spots of brown…) are owned by the Taft family, one of just a handful of working farmers in the Huntington River Valley. With all wet and stormy weather we’ve been having recently, these kinds of clouds have been a frequent sight as the heat of the day piles them up along the higher terrain. Some build into cumulonimbus clouds dumping rain and flashing lightning. Photo Info: Nikon D600, Nikon 18-35mm lens @ 35mm, polarizing filter, ISO 800, f/14, 1/400″. 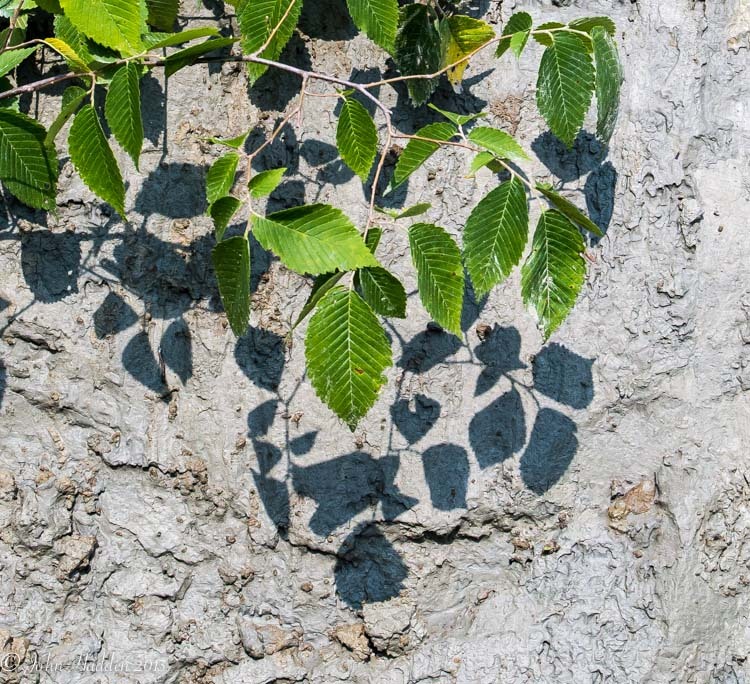 Elm leaves stand out in stark and colorful contrast against the grey clay of the eroding stream bank along Brush Brook. Photo Info: Nikon D600, Nikon 18-35mm lens @ 35mm, ISO 800, f/8, 1/500″. Morning sunlight pours over this view along in the Huntington River Valley. With all our wet weather, the corn is struggling a bit. 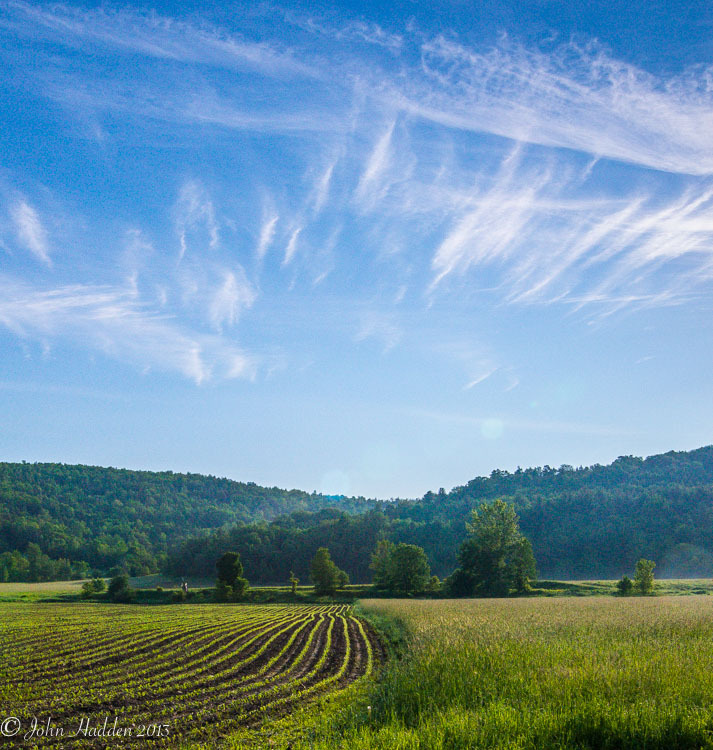 I like the linear interaction of corn rows and the cirrus clouds. 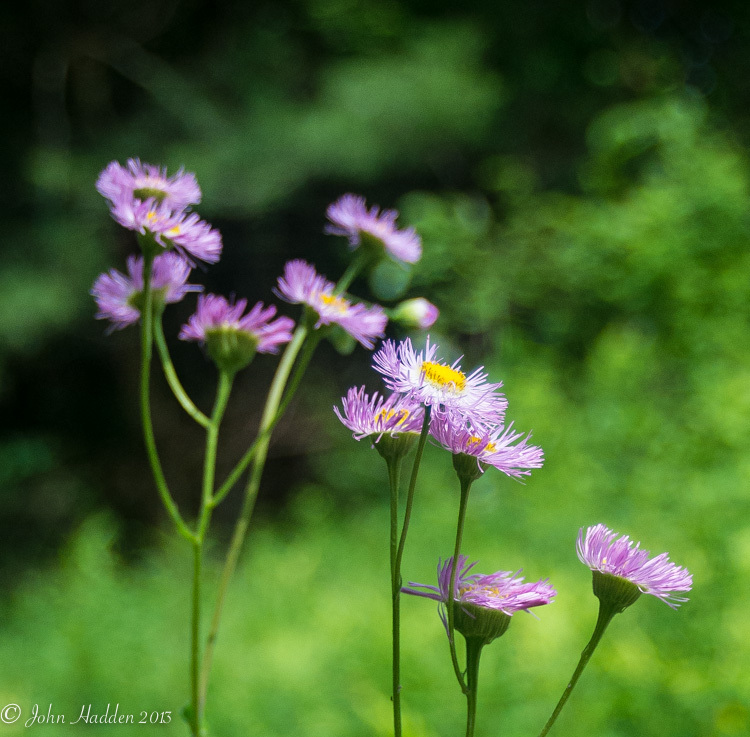 Philadelphia Fleabane catch the morning sun down along Brush Brook in Huntington. 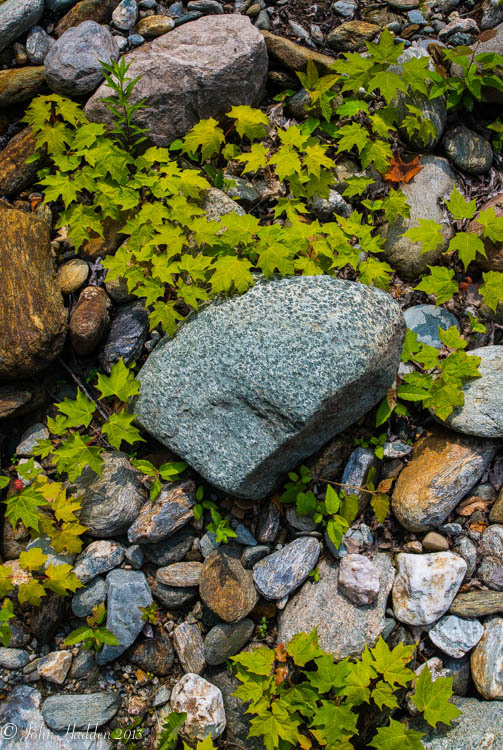 Maple sprouts pop up amongst the river stones on a recently flood-created island of rock and gravel in Brush Brook.